I think I've almost forgotten how to blog. it's been so long- what's the pattern again? Title, "short" spiel, recipe talk, recipe, and photos scattered throughout, right? When I first started blogging, I worked so hard for everything to fit a cookie cutter (only appropriate because this is a baking blog) mold. I spent so much time making sure that my blog followed a specific format, so much that it stopped me from continuing. But I think I've learned that there's no perfect science for blogging. It's really just whatever you want and however you want to do it. You write what you want to write, because after all, it's your blog. So the more I wanted to blog, the more I talked myself out of it because I felt like I wasn't good enough. I spent so much time comparing myself to others and expecting myself to have x, y, and z in order to properly blog. and finally, after many internal debates, it clicked. There's never going to be a perfect time to start something like this (and many other things in life, actually). But it's worth trying to see where it'll go, right? gracefulleats is a baking venture five years in the making. It started in 2013 in a tiny kitchen apartment out of boredom and with inspiration from following my mama around the kitchen as a kid. it's captured the past five years of my life and has opened so many doors, and I'm so grateful. Things are different now, but that's okay, because I'm hoping that that'll continue to happen. I think because this is such a big part of me, it grows when i grow, and vice versa. I don't know where this will go, or how long it'll last, but I'm going to wait and see. Here's to the next couple years- thank you, readers, for walking with me through this. 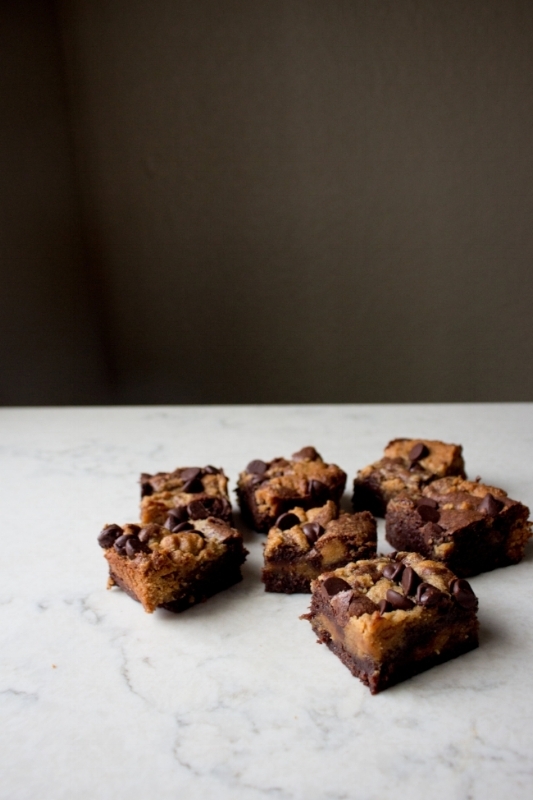 We're starting the restart of gracefulleats with peanut butter swirl brownies. I actually didn't grow up eating chocolate and peanut butter together. I ate chocolate separately and peanut butter with...get this: carrots. I swear by this combo, but my friends think otherwise. 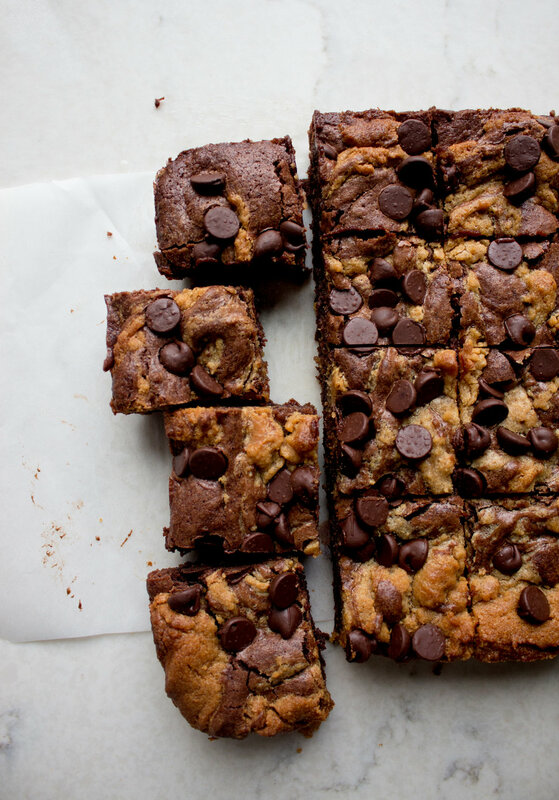 This recipe starts off with a thick peanut butter batter-peanut butter, sugar, and don't forget the salt-that is swirled with a rich brownie batter-chocolate, butter, and your usual brownie ingredients. 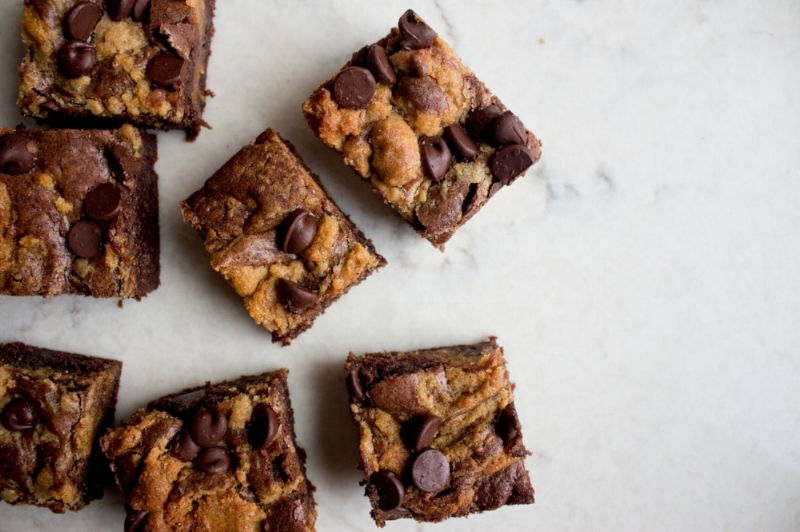 Top it off with chocolate chips, bake for 30-ish minutes, and you'll end up with a decadent dessert. It's rich, fudgy, and perfect straight from the fridge or at room temp. It's one of those things where you know exactly how rich (and bad) it is, so you cut a piece of a piece of a piece, only to end up eating the whole thing after passing by it a couple times. baker's notes: i browned the butter when I made these, probably because I had just discovered browned butter and was trying to add it to as many things possible. But this recipe isn't really the place for that, and I couldn't taste the nuttiness of the butter against the chocolate, so no need to spend your time doing that. a fair warning though, brown butter will make its way through many things here. you can thank me later. p.s. am i really doing this?! I'm kinda sorta super excited and nervous!!!! Preheat oven to 350 f. Line an 8x8 square baking pan with parchment paper, and grease the bottom and sides. make the peanut butter batter: whisk all the ingredients in a bowl until smooth. I used jif creamy pb for this. make the brownie batter: I browned the butter, but found that it didn't make much of a difference against the chocolate in the brownie batter. but melt together the chocolate and butter- you can do this either in a medium heatproof bowl over simmering water, or in the microwave in 30-second intervals, stirring between each. Just melt them both until they are fully melted and smooth when you stir. whisk in sugar, then the eggs (one at a time). Add vanilla and salt. Stir in flour, but don't overmix. Spread about 1/3 of the brownie batter in the bottom of the pan. Dollop the peanut butter batter in big spoonfuls over the brownie layer. Dollop the rest of the brownie batter in between the peanut butter dollops. Use a butter knife to swirl the batters together, but don't overdo it, or you'll lose the pretty swirly effects. sprinkle the chocolate chips over the batter. bake the brownies for 30-35 minutes, or until a toothpick inserted comes out batter free. cut into squares or uneven rectangles like me, and enjoy!